Today is the day when your knowledge will be tested. You are ready for it, aren’t you? Despite the fact that you studied all the material well, you are still a little bit worried. Have you done everything right to prepare for the test? Have you used your strengths and skills to the fullest? Let’s check whether you have prepared perfectly by going through the list of things to be avoided before taking a test. The day of the test is not the right time to study. You should have prepared well before the test. Now it is too late. If you decide to open the study book before the test starts, you are more likely to feel scared and panicked rather than learn the material. So, it is better to go blind in case you have not prepared at all. If the test is due to begin at 8:00, make sure you arrive at least 30-45 minutes earlier. Indeed, there will be a lot of stuff to do before the exam. For example, you may need to solve parking issues, go to the restroom, drink some water, stand in queue, etc. So, make sure you arrive early and have enough time to get ready before the test. If you happen to wear uncomfortable outfit, the chances are high that it will distract you from the test itself and will make you feel irritated. On the other hand, if you wear too comfortable clothes, such as your jammies, it is likely that you will feel sleepy. So, it is necessary to check weather forecast and prepare the outfit that is both cozy and up to the weather. Many dietitians state that people who eat breakfast increase their mental productivity. By arriving hungry, you increase the chances of being distracted by your noisy stomach. The lack of concentration may also negatively influence your test results. So, even if you do not eat breakfast normally, grab a healthy snack in the morning before an exam to increase your chances of success. It is essential to have a good sleep the night before an exam. It is unacceptable to party the whole night, drink alcohol and have only a few hours of sleep. By doing so, you decrease your chances of successful test outcome to the minimum. So, plan your time wisely and avoid arriving to the test having a hangover. 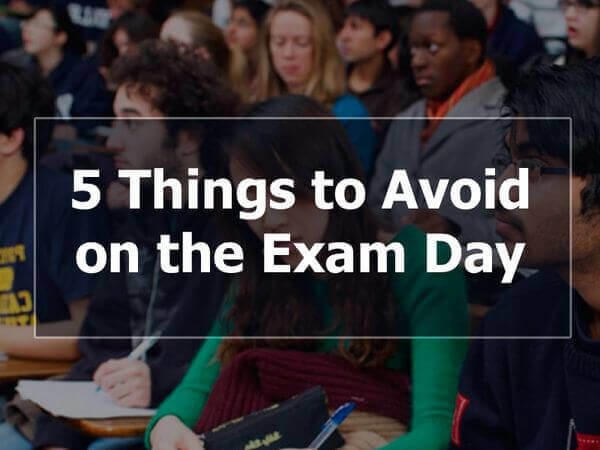 So, if you avoid these 5 things on exam day, you will have good chances to pass it with flying colors. Now it is high time to impress everyone with your knowledge. Good luck!